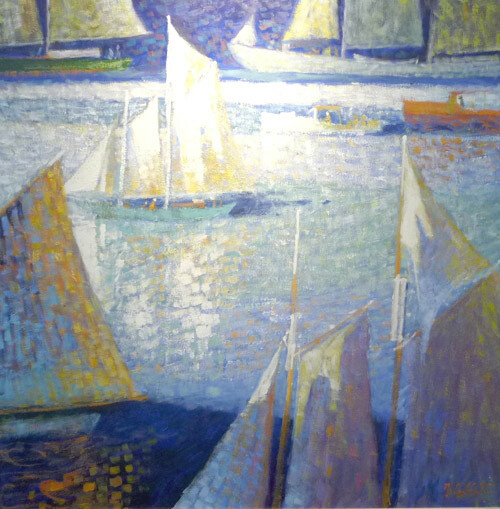 Don Rainville was born in Salem, Massachusetts and presently lives in midcoast, Maine where he maintains his studio. Foregoing acceptance to art school at the Massachusetts College of Art, he parlayed his interest in the natural world by attending the Essex Institute of Agriculture in Hawthorne, Massachusetts, studying Forestry and Ornamental Horticulture. Upon graduation, Don entered the world of high end antique and art restoration. For twenty years, he was able to hone colorist skills and the ability to experiment with diverse materials; the consistent nature of such refined work is in direct contrast to how he approaches painting. Employing action techniques, his works have been likened to landscapes of "abstract realism." Don paints in house oils, using torn shapes of lightweight cardboard and plant clippings rather than brushes; by doing so, paint to a greater degree can dictate form. Don’s paintings begin with abstract intensity, leading to a concentrated focus on refinement—the last 10% of any painting takes 90% of the time to complete—and most of his paintings take several months to finish. Primarily, his work focuses on “treescapes” and the never ending inspiration provided by Maine and New England forests—Don likens his paintings to orchestrations of visual music, much like jazz which is different from more formalized concepts of music. His paintings are invented as they proceed, and as each portion of the composition comes forward on a moment by moment basis, the components are random and abstract, yet consciously orchestrated—the growth of a living forest works in much the same way. Don works to create paintings where a viewer feels themselves present within the scene to a point where there is an actual unconscious desire or instinct to use all of one's senses, not just sight. Ben McGinnis has been an award winning illustrator, graphic designer and fine artist for over thirty years, Originally from Ohio, Ben attended Kent State University to study all forms of art and has primarily worked in advertising since then. His personal work however, ranges from small sculptures and wood carvings to paintings and drawings and lately, unique drawings of trees. be. Some are shaped by man and others by elements of nature and a natural adaptation to their surroundings. Joan Wye was born in the U.S. but lived in Berlin, Germany for most of her childhood until the age of thirteen. Her mother had sent her to live with Joan’s great aunt who ran a boarding house, and Joan’s grandfather who was the conductor of a symphony orchestra. In 1939 Joan’s mother came to rescue her from the horrors of Nazi Germany and take her back to the U.S. and then Argentina. After high school in Buenos Aires, Joan left to enroll in the Art Student League of NY where she had her formal training. She married another League student, had a daughter Carol, and the family moved to Provincetown, Massachusetts. Joan had started out a painter but in Provincetown she took up the medium of wood carving and to a lesser degree bronze casting. After twenty years in Provincetown, she divorced and moved to Somerville, Massachusetts with the man who would become her second husband, the painter, Jackson Gregory. They both found space in a factory building that was to become a well known artists and artisans studio building: 20 Vernon Street in Somerville. Joan initially created some large papier mache brick sculptures and then invented a tile making process which led to an art tile business called Belfast Bay Tileworks. Her husband Jackson joined her and for the next 18 years Belfast Bay designed, produced and sold their art tiles in the metro Boston area, New York, Cape Cod, Maine and other locations round the country. In addition to residential installations, she and her husband created public art tile murals for Boston area’s Red Line (MBTA), The Children’s Hospital, New England Home for Little Wanders, and Roberts School, as well as for the Niagara Transportation Authority in Buffalo, NY. Wye also started making art works using tile mosaics as a medium. In 1985, Wye and Gregory bought property on Vinahaven Island, Maine and moved there permanently in 1990. They bought a much reduced version of the tile business with them to Vinalhaven which they continued until 2000, when they retired from the tile making to devote full time to their painting. With a spacious studio, Joan finally got back to her first love, painting. She was a prolific artist and made up for lost time by turning out about 300 paintings in the last ten years of her life. 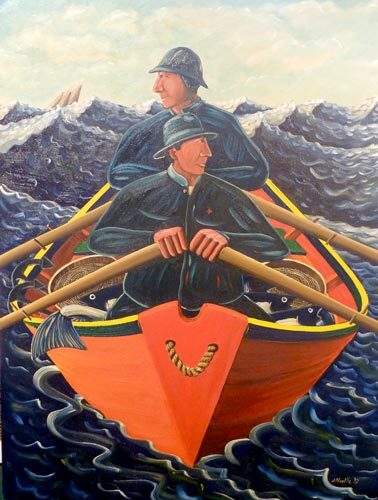 Wye is associated with number of galleries in Provincetown, Boston and New York. Her paintings, sculptures, mosaic tile pieces are in collections across the U.S. She died at home on Vinahaven in August of 2006. Born in 1938, Jackson Gregory grew up in Provincetown, Massachusetts. His father was a printmaker and photographer and his mother a concert pianist and piano teacher, who were part of the sizable art community in that town. His parents and artists friends encouraged Jackson in his early efforts in art making. He is a graduate of the School of the Museum of Fine arts (SMFA) in Boston where he spent ten years as a student, graduate student, Traveling Scholar and teacher. In 1967 after two years of teaching, Jackson left SMFA to concentrate on his own work, which by this time called for a more complete involvement of time and effort. This was the beginning of his use of geometric forms as the basis of his work. He added ceramic tile as a medium in 1977 and also created public art murals in Boston, Cambridge and Somerville, MA., and Buffalo, NY. Gregory lives and maintains a studio on Vinalhaven Island in Maine. He and his wife artist Joan Wye moved there in 1990. Joan died in 2006. Awards include: 47th Bartlett Traveling Scholar: Grant and Fellowship, Fine Arts Work Center, Provincetown; Boskop Foundation Grant, Council for the Arts and Humanities, Somerville Arts Council, MA. Selected Exhibitions: Cornell University; Museum of Fine Arts, Boston; De Cordova Museum, Lincoln, MA; City Hall, Boston; Brockton Art Center; New Era Gallery; First National Bank of Chicago; Harbor Square Gallery, Rockland, Maine, and numerous private collections. Born in 1959 in Little Rock, Arkansas, contemporary American realist painter James Michael Bonner received his formal training in art at the University of Arkansas at Little Rock primarily under the late Al Allen. Citing the painters Andrew and Jamie Wyeth as major influences of his art, James taught himself how to paint with egg tempera and dry-brush watercolor eventually developing his own identifiable style. In addition, Jamie Wyeth’s proclivity for mixing different mediums has influenced him with incorporating oils, acrylics, casein, and gouache into his work. Having a desire to experience what other artists, including the Wyeth’s, have when in Maine, James began visiting there in the 1990’s and always enjoys painting and drawing the often-overlooked scenes that fade into the background of everyday life. Maine is beautiful and gritty all at the same time. It’s these opposing forces that oftentimes are explored through the hidden ambiguities of his work. In 2003, while rock climbing, James suffered a traumatic injury that would change the direction of his life away from art for almost a decade. The aftermath of the accident left him without the ability to paint because of limited dexterity in his hand. Unhappy without the ability to express emotion through his art, he was determined to comeback. In 2012 he began the arduous therapy of re-training his motor skills to facilitate the delicate details of his art. Although it takes longer to draw and paint now, some of his recent pieces have proven to be some of his “strongest” pieces to date. James currently resides in Arkansas with his wife Hope and their two dogs Mocha and Maggie. He has artwork in corporate collections in the south and east coast, along with many private collections in Arkansas, New York, New Hampshire, Massachusetts, Washington DC, Florida, Delaware and Maine. “My intent as a painter is to create a narrative that pervades the painting. By starting out with the literal truth and then relying mostly on memory, I begin to think or dream away the extraneous detail of a particular scene or object until I’m down to the “bare bones” of what I’m emotionally connected to. Simplicity, to me, is always better. Gordon Greenwood majored in art throughout his academic years in the northeastern United States, ultimately completing a Master of Fine Arts degree from Temple University in 1953. There were periods of residence in Japan, Hawaii, California, Nevada and finally settlement in Camden, Maine. in 1988. Artwork was pursued in all these locations, but there were stretches of time when the path of life took other directions. Greenwood explores diverse subjects in differing degrees of representation, but remains generally grounded in a sharply defined symbolic and simplistic style that often emphasizes forms suggested by Nature. Other depictions or imaginations are sometimes present, but always an attempt is made to reflect the core essences of things, whatever they are. Of course, the degree of subjective alteration determines whether or not there is recognizability on the part of the viewer, also depending on the viewer’s own experience. The artist’s intent, nevertheless, is to evoke feelings of familiarity even if they are subconscious. Planned ambiguity is also a recurring theme. Early work was done in oil paint, but a switch to acrylics was made by the late nineteen sixties. The use of acrylic paint allows for many differing methods of application. A certain richness and variety of surface texture can be achieved, often within the same painting, which contributes added interest. A development in that same vein explores the vibrancy caused by the occasional juxtaposition of color on color in dotted or mottled configurations. Sprayed on color is also used. Former instructor at the National Academy and current member of the Academy and numerous other important organizations, Serge's mostly figurative paintings of modern urban living have gained him renown in contemporary realism. 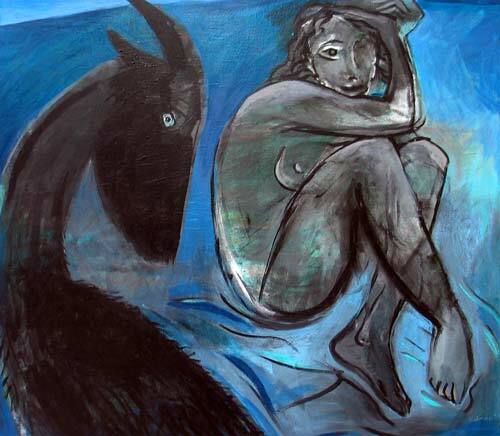 Born in 1923 in Pushkin, a suburb of St. Petersburg, Russia (then Leningrad), Serge Hollerbach drew constantly as a child, encouraged by an uncle who was an art and literary critic in Leningrad. An ardent and frequent visitor to the Hermitage Museum, Hollerbach decided at 17 that he would become a painter. He had studied at the High School of Art for only six months when the Nazis occupied the small town where he lived. “Subsequently, I spent the war years as a laborer in Germany, where I was sent with hundreds of thousands of Russian men and women to work in the fields and factories,” Hollerbach says. After the war ended, he enrolled in the Academy of Fine Arts Munich, where he was “drilled in quick linear drawing and expressionistic characterization.” In 1949, he embarked on a career as a professional artist in New York City. 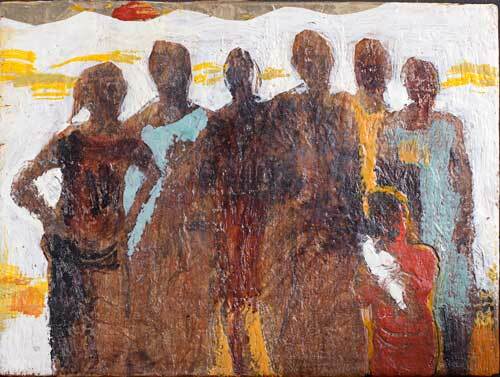 By the late 1950s, he was exhibiting his work in the city, across the country and in Europe. A frequent contributor to The Artist’s Magazine throughout its history, Hollerbach, though legally blind, continues to produce work of beauty and vigor. Born and raised in New York City, Alan Fishman has been an artist for more than forty years. He received a BFA from Cornell University, with further study and years of residence in Italy. Fishman's works are continually exhibited in group and solo exhibitions, and can be found in many collections around the world. His bright acrylic paintings are bold, direct, and filled with a distinctive musical energy. With a love of color, texture, and form, Fishman’s paintings reflect and refract the natural world, the realm of ancient myth, the tangle of human relationships, and the complexity of the human spirit. It’s no small coincidence that his work is so often described as lyrical: Alan Fishman is also an accomplished classical musician, who has been playing the piano since the age of five. As Steven May wrote in a featured article in Portland Magazine in 2004, “Fishman traces his artistic roots mainly to Europe, citing as examples Klee, Matisse, Monet, and Picasso. And while his art may start with recognizable forms, it primarily reflects his interest in light, movement, color, and abstraction." A Professor Emeritus of the Fashion Institute of Technology, Fishman now lives with his wife and their son in a converted barn on the coast of Maine. Having always lived in rural New Hampshire, I observe with great concern the ever dwindling fields, farms, marshes and forests that I grew up loving and taking for granted. Through my paintings I hope to bring awareness to the irreplaceable beauty of this rural country and open Atlantic shoreline. These everyday scenes of marshes, meadows, forests and farmland, so filled with sun and shadow, color, powerful contrasts and overall natural grace that I find so much inspiration in, are becoming increasingly rare. Sally graduated with a BA in Fine Art from the University of New Hampshire in 1971. She then went on to study with Clifford Smith. Willa Vennema's paintings have been highly influenced by her life-long association with Swan's Island, where she has summered since childhood. Her summer medium is acrylic, working quickly in the sun-sparkled world, painting directly the experienced moment and the magical light. Winter is about the paint, the "sensual aspects" of the oils and cold wax, exploring the inner world where "color, texture shape and line interweave and eventually tell a story". Together these worlds intermingle and fully express the deft hand of a painter looking both within and without, ever-exploring the impact of one upon the other. Born Independence Day, 1962 in New York City, Willa Vennema grew up in Greenwich Village. The sixties and seventies in the Village were a time of appreciation for art and expression, the place where Bob Dylan and many other musicians and artists found inspiration. From age three to 13, Vennema attended the City and Country School, a small, progressive elementary school blocks from her home. The creative teachers at City and Country, who used hands-on art projects, music, and free play in their curricula, instilled in her a love and appreciation for all art forms. Her experience there was also the foundation for her continuing creative work with young children. As a teenager, Vennema studied classical music and attended the High School of Performing Arts as a Flute Major – made famous by the eighties TV show Fame. Although music led Vennema to Oberlin College in Ohio, she switched the focus of her creative energy to Fine Art and studied Art History and Studio Art there. After graduation, Vennema returned to New York to continue her study of Fine Arts at the Cooper Union for the Advancement of Science and Art. She was awarded a full tuition scholarship and received her B.F.A. in 1987. After graduating from the Cooper Union, Vennema moved her studio to a store front in Cobble Hill, Brooklyn, and began her life-long routine of working in the mornings with pre-schoolers, and painting in the afternoons---while also squeezing in graduate classes at the Bank Street School for Education in the evenings. In 1989, Vennema and her now-husband, Carter Waldren, also a painter, moved to San Francisco. Here Vennema participated in many group shows and was featured in several one-woman shows. The landscape of undulating mountains just across the bridge from San Fransisco still informs the landscape work of Vennema today. But the pull of the coast of Maine, where Vennema grew up summering, brought her and her husband back East where they made their home in Portland. When her son was born in 1997, Vennema founded The Creative Play House, a home-based preschool where she employs the kind of arts and play-based teaching that was so fundamental to her own learning. As teachers, both Vennema and her husband are able to spend the summer with their two children, Oriana and Casey. They quickly settle in to “Island Time” on Swan’s Island, a small isle off Mt. Desert Island, where Vennema's family has summered for almost 50 years. The summer of painting the waters, woods, rocks and trees of Swan's and surrounding islands serves as inspiration during the long winter months when Vennema returns to her studio and home in Portland. Here, through the process of painting using the fluid medium of Encaustic, Vennema relies on her imagination and memory to distill, reinterpret and create anew her vision of the Maine Coast.